Never before have I had the chance to buy a fresh truffle at my local farmer's market, and I seized that opportunity this morning. I'm told that the season for Tuber melanosporum is just getting started. This one was sold to me by folks that specialize in beautiful dry-cured hams and is from the nearby oak woods. I actually smelled them before I saw them, and the scent is everywhere around us: the car, the kitchen, the pantry. We wasted no time in shaving off a good quantity to use in omelettes made of farm-fresh organic eggs. The rest of that nugget is destined to be tossed with roasted roots and bulbs: sweet potato, céleri-rave (celeriac), rutabaga, and fenouil (fennel) for a Christmas dinner side dish. It was frosty this morning at the market, but just as busy as ever. Freezing together in open air shopping solidarity and the shared mission of acquiring fresh ingredients for holiday dinners seemed to draw people together. I had more interaction with other market-goers than on any other trip. May I suggest you to put the rest in an hermetic jar with some fresh eggs. 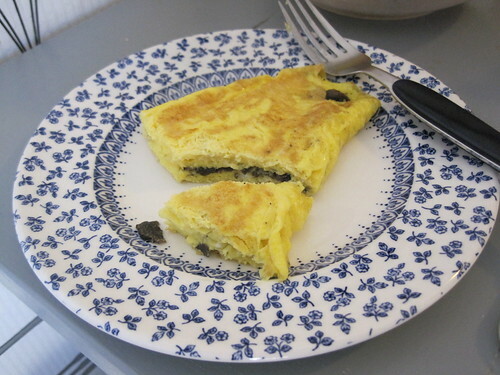 Omelettes with those eggs will taste the truffe as they were cooked with it. Yes, I've read about that practice, and am curious to see how well it works. 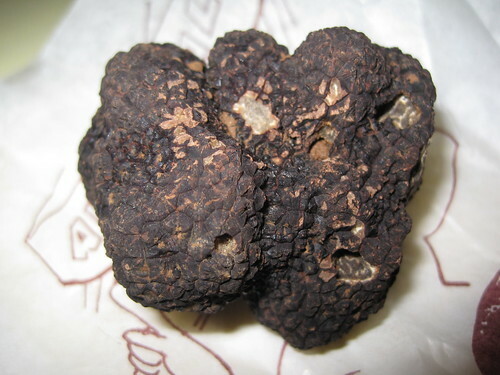 Buying a fresh truffle at a farmer's market is on my bucket list. You are fortunate to have done it.